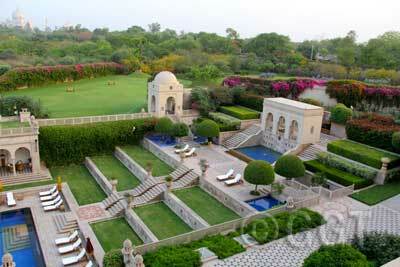 Oberoi Amarvilas, Agra, India (photo by Geringer Global Travel, India tour operator). Oberoi Hotels & Resorts in India is synonymous the world over with providing the right blend of service, luxury and quiet efficiency. Internationally acclaimed for all-round excellence and unparalleled levels of service, Oberoi hotels and resorts have received innumerable awards and accolades. A distinctive feature of The Group’s hotels is their highly motivated and well-trained staff who provide exceptionally attentive, personalized and warm service. The Group’s new luxury hotels have established a reputation for redefining the paradigm of luxury and excellence in service among leisure hotels around the world. The Oberoi, Gurgaon: Towering Corporate headquarters dot the city of Gurgaon, evidence of its growing importance. Amid the competing structures is a place that provides welcome respite with an island of Height, Light and Space – The Oberoi Gurgaon. Forest green, ocean blue and a striking jewel box providing just the relief from the world outside it. The Oberoi, New Delhi: The hotel reflects the capital city’s spirit in a harmonious blend of tradition and contemporary sophistication. Recognized as a pioneer among luxury hotels in India, The Oberoi, New Delhi was the first hotel to offer a 24 hour personal Butler service. Its exquisite interiors, impeccable service and fine cuisine combine to make it amongst the most graceful and elegant downtown hotels in Delhi. The Oberoi, Mumbai: Located in the city’s prime business and shopping district of Nariman Point, The Oberoi, Mumbai has been completely redesigned to be the ultimate destination for contemporary style and luxury in the city. Overlooking the ocean, the hotel welcomes you with space and serenity. Luxuriously appointed guestrooms have been meticulously planned with a host of innovative features using the latest technology. The Oberoi, Bangalore: The Oberoi Bangalore is located on MG Road, which is the heart of the business, financial and shopping districts of Bangalore. Recognized as a pioneer among luxury hotels in Bangalore, it is an oasis of calm in the heart of the city. All the tastefully appointed rooms have large balconies that overlook the beautiful gardens. The Oberoi Grand, Kolkata: The Oberoi Grand, fondly referred as the ‘Grande Dame of Chowringhee’ offers the ultimate classical residence in the City of Joy. This heritage hotel’s neo-classical facade and grand pillared entrance mark a successful fusion of classical Victorian and traditional Indian style and reflect the city’s colonial history. The Oberoi Cecil, Shimla: A celebration of the elegance and grace of the Colonial era in the Queen of Hill Stations, located in the majestic Himalayan ranges, The Oberoi Cecil is very much a part of Shimla’s colonial history. The hotel has been restored to its original grandeur with wood floors, period furniture, crackling fires and an inviting ambience. Built around a beautiful atrium, the rooms offer splendid views of the mountains and valleys. Wildflower Hall, Shimla in the Himalayas: Situated at 8,250 feet in the magnificent Himalayas, Wildflower Hall is a fairy tale luxury resort set in 22 acres of virgin woods of pine and cedar. The former residence of Lord Kitchener, rebuilt to a new magnificence, Wildflower Hall recreates the grand style of the colonial era. Wood paneling and original artwork create an aura of old world charm. Teak wood floors, hand knotted rugs and rich furnishings complemented by spectacular views make the rooms very special retreats. The Oberoi Amarvilas, Agra: Rated among the leading resorts in the world, The Oberoi Amarvilas offers the best view of the Taj Mahal in Agra. The hotel is located 600 meters from the Taj Mahal and all rooms, suites, lobby, bar and lounge offer breathtaking views of the monument. Built in a style inspired by Moorish and Mughal architecture, the resort is a splendid display of terraced lawns, fountains, reflection pools and pavilions with rich interiors that take you back to an era of Emperors and Princes. An interlude at The Oberoi Amarvilas is truly unforgettable. The Oberoi Rajvilas, Jaipur: Rated among the leading resorts in the world, The Oberoi Rajvilas is a unique way to experience Jaipur, one of India’s most vibrant and exotic destinations. Amongst the most preferred luxury hotels in India, the distinctive character of The Oberoi Rajvilas revives the gracious lifestyles of India’s legendary Rajput princes. The Oberoi Vanyavilas, Ranthambhore: Nestling in the natural beauty of the wilds, The Oberoi Vanyavilas is India’s leading luxury jungle resort on the edge of the Ranthambhore Tiger Reserve. The luxury tents with finely embroidered canopies, luxurious bathrooms and private walled gardens are in perfect contrast to the ruggedness of the jungle. The Oberoi Udaivilas, Udaipur: Udaipur, in the heart of Rajasthan, is a city of majestic palaces and beautiful lakes. Here, adorning the banks of Lake Pichola and standing witness to the historic City Palace, The Oberoi Udaivilas captures all the romance and splendor of a royal era. The Oberoi Motor Vessel Vrinda, Kerala: The picturesque backwaters of Kerala are one of India’s most enchanting holiday destinations – and The Oberoi Motor Vessel Vrinda, is the perfect way to experience it. The Oberoi Motor Vessel Vrinda takes guests on a two night or a three night journey through the tranquil waterways of “God’s own country” – Kerala. These hotels are suggestions of properties that can be included in a tour to India. We will be happy to customize an India itinerary to include Oberoi hotels only where possible or to mix with other luxury properties. Contact us at 877-255-7438 or email us at info@geringerglobaltravel.com to discuss how we can create a personalized luxury India tour for you.